THE TEXT OF MARINUS THE TYRIAN AND CLAUDIUS PTOLEMY: ”Geographia”, Book 4, chapters 1,6, 7 and 8. The west coast of “Libya” explored, the Zero longitude determined and the East Coast capes located. Various papers by this author concerning Eratosthenes, Strabo, Marinus the Tyrian and Claudius Ptolemy have concentrated upon their descriptions of the Mediterranean Sea (and also Britannia), but largely ignored the west coast of Africa. However, the research to explain the variety of geographical differences had been carried out. Text length limitations were generally the reason for the sub-division of the afore-mentioned geographer/historians work and its non inclusion. Then, in writing about the English cartographer, Christopher Saxton and his 1597 map of Britannia, it was necessary to discuss the prime meridian he had utilised, and thus this paper was abstracted from the MT/CP original papers. That prime meridian was shown to be the Cape Verde Islands, and, as the Saxton map was also shown to be a Ptolemaic construct, it thus accorded with their prime meridian, or zero longitude. That zero longitude was stated as passing through Inaccessa Island, Pluvialia Island, Capraria Island and Ninguaria Island, as recorded in Book 4, chapter 6 of the ‘Geographia’. This paper, the fourth in the series, analyses the west coast of Libya (our Africa), in a similar manner to the afore-mentioned papers, by aligning the map plots, geographical and Ptolemaic at a single point, Sacrum Promontory, and also to a single scale. Thus the prime meridian used by MT/CP is confirmed. The east coast of Libya (Africa) is also examined to ascertain the most southerly point. Caution. The text translated by Stevenson8 has significant errors and should always be tested against another of the (10) translations. It is normally copyist error which can be shown as the prime error, but not always. This author has used Codex Lat V F 328 from the Library of Naples as a check document. Then in 4.196, Herodotus states that the Carthaginians traded beyond the Pillars of Heracles with the peoples of Libya. In confirmation of the last statement, in the first half of the sixth century BCE, the Carthaginian admiral Hanno sailed on a voyage along the west coast of Africa, probably as far as Gabon. Pliny the Elder3 stated that Hanno actually circumnavigated Libya (Africa) and arrived back at Arabia; i.e. an opposite voyage to that previously described. The text concerning the voyage of Hanno is a Greek translation of a Punic inscription that had been displayed in the Temple of Ba’al Hammon in Carthage. This is confirmed as Mount Cameroon, 4° 13’N: 9° 10’E, the only active volcanic area of West Africa. This text appears to be based upon the voyage of Hanno. The texts of Eratosthenes, (c285-194BCE), particularly the ‘Geographia’, are known mainly from the text of Strabo6 (C64BCE-AD21). Libya (now Africa) is mentioned but briefly in Strabo’s text, 2.5.15 and 17.1 and 2, where-in Strabo indicates that there is a coastline south of the Detroit of Gibraltar, but endeavours to curtail the knowledge, to a small section finishing at the Atlas Mountains. Thus we enter the first century of our Common Era, the times of Marinus the Tyrian7 and Claudius Ptolemy8. As mentioned previously, there are other writers such as Pliny the Elder3, who mention Libya, but their text is mostly a reworking of older sources already mentioned. In any study of the cartography of the oikoumene, the first named is synonymous with the second. We know little about Marinus the Tyrian, as Ptolemy addresses him, but the text written by Ptolemy, his ‘Geographia’, is acknowledged by him as a near copy of the work of Marinus the Tyrian. In Book 4, chapter 6, ’The location of interior Libya’, there is a detailed description of the west coast of Libya from the terminus of ‘Mauritania Tingitana’, south to the ‘Hesperius or Great Bay, located in 14E:4N, on the west by the western ocean’. There is an interior point, the Arances Mountains, 47° 30’E: 1° 30’N, closer to the Equator, but in Book 4, chapter 8, (discussed later) ‘Location of Interior Aethiopia’ (east coast), we read of recorded land points south of the Equator. Thus it is these islands which establish the longitude of the world. In previous papers, this author established that there were zero points which could be aligned upon a geographical map and a matching scale Ptolemaic map. The projection of the geographical map must of course reflect the Ptolemaic projection, and for small scale maps the system of Meridional points is more than adequate. Thus when the two maps are overlaid, with the coincident point aligned, and not a geographical graticule, other than NSEW, the survey details of the MT/CP map can be evaluated. The zero point for the western Mediterranean was determined as Sacrum Promontorium, now Cape St. Vincent. It is the south west corner of Iberia. This point is given the co-ordinates by MT/CP of 2° 30’E: 38° 15’N, and geographically 90 West: 370 North. This point had already been utilized by Eratosthenes’ as the base to dimension his oikoumene. It is also from this point that Eratosthenes’, so we are informed, added 2000 stadia to the length of his oikoumene (at each extremity), no doubt in preparation for the discovery of more land, habitable land, to the south. This would have ensured his desired proportion between the length and breadth of the oikoumene was maintained at 2:1. Thus if a pair of maps are prepared as Diagram 2 illustrates, the one being the Libya map by MT/CP covering the west coast or Atlantic littoral, and the other a corresponding geographical map of Ptolemaic projection. They can then be aligned using the single coincident point of Sacrum Promontorium. The most striking feature of the MT/CP plot is that the west coast of Libya is plotted as a basic southerly progression from the Detroit of Gibraltar, where as, the geographical west coast is a south-south-west, and then south alignment forming a rather large bulge which then sweeps eastwards into the Gulf of Guinea. With this form of comparison it is possible to project the coastal points of MT/CP onto the geographical map plot and to cross refer each point thus enabling actual places to be determined. The most important cross reference is that of the Islands noted by MT/CP as lying on the zero longitude. The alignment is quite perfectly the Cape Verde Islands which are geographically between 15/170 N and 23/250 W.
The fact that one of the islands named by MT/CP is ‘Canaria’, has led to the assumption by many authors that the zero longitude is in fact the Islas Canarias which vary from 1.50 to 50 west of the African coastline. However, as has been indicated they are 15 degrees to the north of the islands shown as on the zero longitude. The west coast of Libya is terminated by Hypodromus Aethiopia, 14E: 5° 15’N, although in the interior are noted the Arualtes Mountains, 33E: 3N and the Arancas mountains 47° 30’N: 1° 30’N. But, the text of Hanno indicates he reached at least to the Equator, and the shoreline of Gabon. From the Detroit of Gibraltar, Hanno describes sailing west and south, where-as MT/CP have a slightly east of south bearing for their coastline. The difference is some 17 degrees of longitude between the MT/CP plot and the geographical plot. But, the difference in longitude for the Cape Verde Islands is 13 degrees. Perhaps having confused the Islas Canarias with the Cape Verde Islands the mistake was inevitable, and thus the west coast of Libya, was, or had to be wrongly drawn. In AD1579, Christopher Saxton9 published a map of Britannia as the finale to an Elizabethan era landmark publishing feat, a complete set of maps of the counties of England and Wales. It was published first without bordure scales and had only the centre latitude and longitude markers. But, a careful examination of the map (a British Library facsimile copy) indicated they were not perhaps what they purported to be. 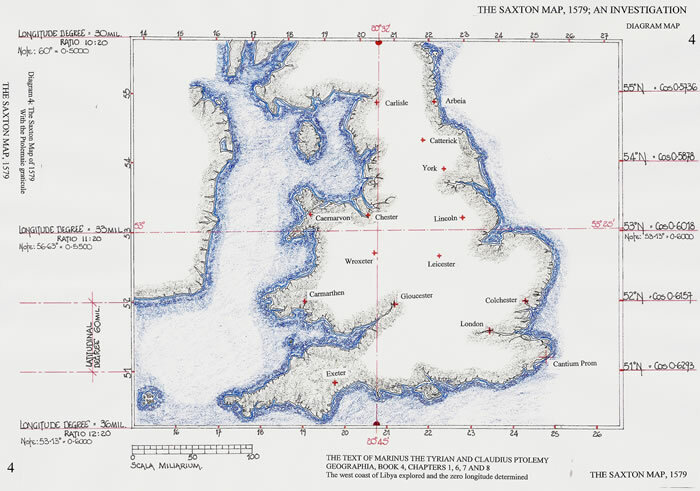 When the map was published with its bordure scales, the defining point of Britannia according to many ancient writers, Cantium Promontorium was indicated by the c250 East longitude. Geographically Cantium Prom., the South Foreland, is 51° 07’ N and 1° 23’ East. The Cape Verde Islands, and in particular their capital Praia is 23° 34’ West. Hence there is by addition the longitude of 24° 57’ from one to the other. Thus, it can be fairly stated that Christopher Saxton utilized the Cape Verde’s for the zero longitude. Why should this be? A full analysis of the Saxton Map sans bordure indicates that it is drawn to a Ptolemaic projection using a graticule of 11:20 ratio. There is, therefore, a 16th century English map drawn to the ratio set down by MT/CP for Britannia in the middle of the 2nd century of our common era, and it has the precise zero longitude as listed in MT/CP Book 4, Chapter 6, The Cape Verde’s. It would therefore appear to be a fact that the early sailors, possibly Phoenician, or Carthaginian, logged the position of these islands on one of their many voyages of exploration. The natural sea current of this area on the coast of Africa, is the North Equatorial Current, and it would sweep craft sailing south away from the coastline of Africa and out past the Cape Verde Islands and St. Vincent. ‘Aethiopia, which is below this land (Aethiopia below Egypt) and entire Libya, is terminated toward the north by the indicated southern boundary lines of the land which we have treated, which extends from the Great Bay of the Outer Sea to Rhaptum Promontory as we have said, and is located in 73° 50’East and 8° 25’South, then by part of the Western Ocean which is near the Great Bay: by unknown land toward the west and the south; toward the east by the Barbaricus Bay, which near the shallow sea is called Breve, from the Rhaptum Promontory even to the Prasum Promontory and the unknown land’. The final text of Book 4 is: ‘Toward the south from the inhabited land to the South Pole the degrees are not definitely known, 73° 35’ or full 74 degrees’. Thus spread across the longitude of Libya from 10E to 67E, are the mountains of the interior including the source of the river Nile, via snow melt-water in the Mountains of the Moon. The two lakes referred to are given at 57E: 6S, and the eastern at 65E: 7S. Thence the river Nile flows in two streams northwards. Ethiopia that lies below this land and all of Libya is bounded at the north by the indicated meridian lines of those lands that we have discussed, which from the Great Gulf of the External Sea stretch to the promontory of Rhaptum previously mentioned, which is situated at 73° 50’; south 8° 25’, and also is part of the western ocean which is at the Great Gulf. Towards the west and south the land is unknown: towards the east, (it is bounded by) the bay called Barbaricus, which is called the Small Sea because of its small extent, and stretches from the promontory of Prasum, and from there by unknown land. The Prasum promontory is situated at 800; south 150. An island named Menuthias lies close by at the summer rising of the sun. It is located at 850; south 12° 30’. The immediate point to be made from this text is that from Prasum Promontory, Menuthias Island lies close by in the direction of the summer rising sun, which is at this latitude, c150 south, approx N650E, i.e. a bearing of 25 degrees north of east. 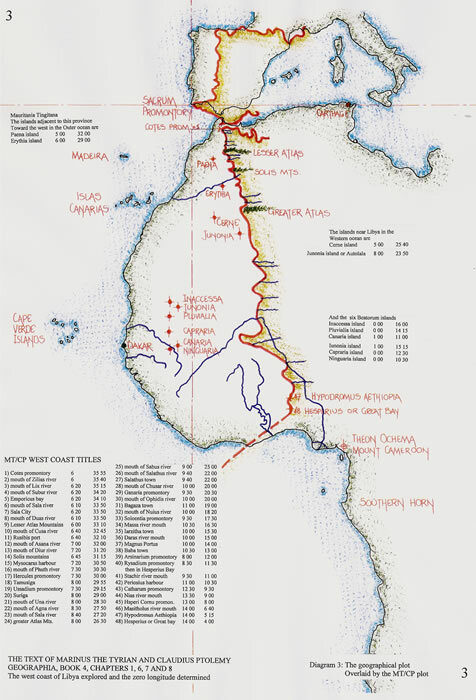 That is the equivalent bearing from Cape Delgado to Victoria Island which is considered in this text to be Menuthias Island as explained later. It is not the intention of this paper to study in any depth the east coast of Libya from the Red Sea to Prasum Promontory, but, without an understanding of how MT/CP terminated their descriptive text concerning Libya, and particularly its southern extent, it is not possible to compare the ‘Periplous of Hanno2’ and the probable knowledge held in the Great Library of Alexandria. However, as diagram 5 indicates, based on the utilisation of a co-joint point at Alexandria, the east coast can be reasonably described. Alexandria has been chosen as the second co-joint location for the overlaid maps for a simple reason, the accuracy with which its latitude compares to the Sacrum Promontory. Alexandria is both geographically and by MT/CP located at 310 N. The Sacrum Promontory is geographically 370N, or, by MT/CP located at 38° 15’N. Thus 6 degrees geographical equals 6 x 604 stadia or 3624 stadia, and 7.25 degrees MT/CP equals 7.25 x 500 or 3625 stadia. This accuracy enables the map plots to be aligned even though the Mediterranean Sea of MT/CP has been expanded by a 115/93 ratio (see appendix). But, this discussion is about latitude not longitude, and thus the coast line of the Red Sea is a very reasonable fit. Then the Horn of Africa with the following southerly coastline is also comparable to the geographic plot. But, there is one point which must be explained, the sudden eastwards movement of the coast of Libya from Rhaptum Promontory, 73° 50’: S8° 25’ to Prasum Promontory, which is positioned at 8°E:S15. This is an obvious error, and both MT/CP have mis-understood the survey details given. . It should be a lone point in the Indian Ocean, as is Cap d’Ambre, the northern-most point of the isle of Madagascar. Therefore it is quite possible to opine that in the Library at Alexandria there was a complete periplus of the east coast of Libya, but its details were totally mis-understood. Indeed, in Book 1, 27 Ptolemy states: ’We have learned also from merchants that from Arabia Felix they sail to Aromata, to Azania, to Rhapta, and to the regions called Barbary. This sailing is not exactly south, but south-west. The voyage from Rhapta to Prasum is also south-west’. There is obviously a great confusion within the details that were researched by Marinus the Tyrian and then written, and possibly not understood, by Ptolemy in the ‘Geographia’. Confirmation of this is given by the near correct location for Menuthias Island in the Indian Ocean, which corresponds to Victoria Island, as the diagram illustrates. This is north of Madagascar, and not part of Libya. Claudius Ptolemy informs us in Book1, chapter 6 that Marinus the Tyrian ‘is known to have found out many things that were not known before. He has searched diligently the works of almost all the historians who preceded him’. Unfortunately the text of Hanno the Carthaginian that we now have is considered corrupt and probably abridged. But, what if any text did Marinus read? It is possible that Hanno, a great navigator, found the Cape Verde Islands which are some 3200 stadia west of Dakar. Or perhaps later Carthaginian explorers followed Hanno, wrote of their experiences, and then copies were acquired by the Library of Alexandria? Somebody in the distant past visited them and determined their location. With the coalescence of the islands, Islas Canarias and Cape Verde, by MT/CP, and then the use of this amalgam as longitude zero, it is necessary to undo their error and quantify the necessary movements. Geographically, Cape Verde Islands to Isla Canarias is 8 degrees; i.e. 24W to 16W and from an overlaid pair of maps, coincident point at Sacrum Promontory, the coastline of MT/CP is 12 degrees from Isla Canarias. Therefore if the coast line of MT/CP were to be moved 12 degrees west there would be a very reasonable coincidence of both map coasts and the Cape Verde Islands would therefore align on both maps. Both MT/CP have shown that they knew of the Cape Verde Islands by using them as their zero longitude. The names given, Inaccessa and Pluvialia2 are apt descriptions. They also knew that Libya/Africa extended far to the south, as the text in Book 4 indicates. Unfortunately, however hard Marinus may have looked, he found no written survey details delimiting distances for this southern land. On the west coast, their southernmost point is very nearly the Gulf of Guinea, which is perhaps 5 degrees north of Hanno’s southern point. The east coast, which was much more widely travelled in antiquity, has as its southern point 16S, half way down the length of Africa. But, it also appears to indicate that the Island of Madagascar was known, although incorrectly identified by MT/CP, and that raises the possibility of another alternative for ’Taprobane10’, as the sea distances quoted by Strabo would also appear to indicate. Madagascar certainly points towards Aethiopia as the text states. Thus it is possible to conclude that there is a total mis-understanding of the data that was available, (or it had been badly copied to produce such mis-understanding), and that the world or oikoumene was well known as Eratosthenes’ data indicates. Why MT/CP did not question or try to prove the proper latitudinal measure is a question that will never be answered, but, perhaps they should have? The zero longitude of MT/CP is thus shown to be The Cape Verde Islands, a fact known in 16th century England, but then lost until the 21st century. The research for the various papers10,11 by this author was carried out between 1980 and 1990. It was then updated (after retirement) in 2001 to 2005. 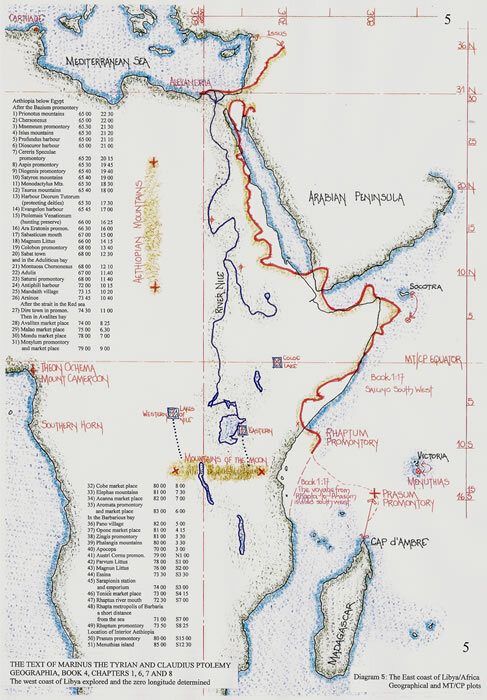 The Ptolemy papers were first submitted to the Cartographical Journal in September 2007, withdrawn for revised diagrams and in that October sent privately to a reviewer. That they have not been progressed is the fault of the author. However in DIO, March 2008, Dennis Rawlins8d wrote a paper entitled, ‘Zero Longitude Revealed: Cape Verde Isles’. This is an excellent paper, and as usual from that author it is a requirement to have a pocket calculator handy. Thus it is possible to opine, that, from two differing methods of research the same conclusion is reached, The Cape Verde Islands are the Zero Longitude. Within the paper, ’The Mediterranean Sea of Marinus of Tyre and Claudius Ptolemy’ this author opined that MT/CP had within their text an error regarding one of the ratio figures utilised in their text. In Book 1: 20, they state: ‘It being given that there are 115 parts into which we divide the equator.’ Following that ratios are given, as diagram 6 illustrates, such that 93:115 equate to the latitude of 360N. But, actually 93/115 = 0.8087 and can be written as 4 x 23.25/ 5 x 23. But, actually cosine 360 = 0.80902 and was thought of in antiquity as 4/5. Thus the 115 parts cannot be a division of the Equator but a measure of the radius expanded from the equator to a nebulous pole, which is easily explained. The small circle diagram included on Diagram 6 indicates the actual usage of the 115 parts. In chapter 24 of ‘Geographia’, entitled: ’How the habitable earth can be shown on a plane so that its measurements are in keeping with its spherical shape’, is a complete description of the methodology used by MT/CP. However, these instructions would appear to have been written by Ptolemy when actually studying the diagram. The description exhibits the same problem as discussed in the text, ‘C. P. Falsification etc’, when Ptolemy describes Britannia from a map and misses the nuances of that map when describing how it should be drawn. There is no necessity for the rectangle to be included, except perhaps to pay homage to the Greek concept of the oikoumene being a 2:1 ratio in size. Here though the 115 parts are shown as providing the cosine ratio and it is obviously used as the radius of the earth circle. By studying diagram 6, a simplified model emerges from the text. Utilizing a single N/S line centrally placed, and one perpendicular to it, the whole concept can be drawn. On the north/south line the spacing is actually latitudinal degrees from 160 25’ south to 630 north. The cosine unit for 630N, a ratio of 52/115 then provides the extra 52 parts to be added. Hence from the Equator there are 63 + 52 = 115 parts or degrees. On the latitudinal circle for 360N, are then marked 90 parts either side of the centre line to form the graticule and the length of the oikoumene at 1800. In Book 7 chapter 5, Ptolemy lists the lengths of the parallels which make up the length of the oikoumene of 1800. He states that the parallel of Rhodes, 36N, is approximately 72000 stadia for the 1800, i.e. that is the 4/5 ratio so often utilised. However, the 93/115 ratio actually produces a parallel length of 72782 stadia, as diagram 6 shows. These extra 782 stadia are the equivalent of 977.5 stadia at the equator and hence can be seen to introduce an error of virtually 2 degrees into any computation made. Thus if some distance measures have been calculated at 93/115 ratio and others at 4/5 ratio, establishing the veracity of each will prove very hard. Having established the usage of the 115 parts, it is now necessary to reconcile the world circle as having 83 parts (as indicated on the second circle on diagram 6), with a radius unit of 115 parts. If the ‘Syntaxis’ figures (see diagram 6) are analysed they produce the following: 47.667 or 47 + 2/3 = 47 + 16/24 and 47.75 or 47 + ¾ = 47 + 18/24 with a median of 47 + 17/24 or 47.7080. Thus the Tropic angle would be 23 + 20.5/24 or 23 + 41/48. But 115 is also 5 x 23, and perhaps a clue to the mathematics used. Thus it is possible to use 47+2/3 = 47+16.3/23 and 47+3/4 = 47+17.25/23. However this is a double angle, two tropics about the Equator. Therefore given that MT/CP would have used proportional figures only, and of necessity ‘rounded out’ the fractions impossible to utilize, either 47+ 16/23 (47.696) or 47+ 17/23 (47.739), which are both within the parameters given, could be used. However if the median angle is taken as 47+ 17/23, the half angle or tropic distance becomes 23+ 20/23 (23.8695) and perhaps produces an acceptable set of figures, capable of simple mathematical usage. Thus it is possible to opine that the 83 parts of the world circle, which are individually 4.337 degrees, whose cosine is 0.997176 or 344/345, which is of course also 344/ 3×115, compares to the second set of figures most favourably. Thus, 360N = cosine 93/115 (36.03) and 630N = cosine 52/115 (63.117). Therefore the Tropics of 11 parts are 2 x 23.86950 or perhaps cosine 105/115 (24.0706), an inaccuracy because the statement was,’ almost exactly 11 units’ and the 47+ 17/23 = 47.7390 or 11.0665 units, where-as 11/83 x 360 = 47.7108 degrees, i.e. the almost exactly 11! That there had to be a follow through from one text to the next is inevitable where the tropics are concerned, as they are the only certainty. They are the geographers and astronomers base points for explaining the oikoumene. Would that ancient mathematicians in using ratio numbers, had not required their reduction to the lowest common denominator. Then, perhaps, there would be a greater chance of resolving their units. Ptolemy in his ‘Megale syntaxis tes astronomias’ stated that the ratio for PI equals 30 8’ 30” (sexagesimals) or 377/120. In China it was calculated as 355/113. Thus any divisor, however much it is considered an irrational number may be found in the ancient geographical and astronomical texts. 1) ‘Herodotus, the Histories ’, (translated by A de Selincourt, 1954 and revised by A R Burn, 1972). Penguin Books Ltd., Harmondsworth, London. ‘The voyage of Hanno, King of the Carthaginians, to the Libyan regions of the earth, beyond the Pillars of Heracles…’ So commences the ‘Periplus of Hanno’, a Greek translation of a Punic inscription. The document is preserved in a single manuscript, dating from the 10th century known as the Codex Heidelbergensis 398, and was published by Sigmund Gelenius in Basel, 1533. ‘The Natural History, by Pliny the Elder’, (ed. Bostock,J and Riley,H T), Penguin Books Ltd., 1991. In Book 5, 8: The exploration of Africa, Pliny writes, ‘Some notes have survived by the Carthaginian commander Hanno, who, in the heyday of Carthage, was ordered to circumnavigate Africa. The majority of Greek and Roman writers follow Hanno both in their legendary stories and in their accounts of many settlements founded by him in Africa: neither memory nor trace of these settlements now exists’. ‘The Periplous of Pseudo-Skylax: An interim Translation, by Graham Shipley2002, available on line, under the translators’ name. ‘Skylax of Karyanda, his circumnavigation of the inhabited sea, Europe, Asia, and Libya, and how many and of what kind are the several nations in sequence, and territories and harbours and rivers, and how great are the lengths of the voyages, and the (seven) islands that are inhabited, in what manner each lies in relation to the mainland’. The Oxford Classical Dictionary, page 553-4 has the biographical details and a list of his written work. The most important for cartographers is ‘On the measurement of the Earth’ and ‘Geographia’. See Strabo of Amaseia, p1447. 6) ‘Strabo, The Geography’, (ed and trans. H L Jones) 1917-1932. The Loeb Classical Library, Harvard and London, Heinemann Ltd. Known mostly from the writings of Claudius Ptolemy, he is thought to have lived c70-130AD and we can deduce he was the founder of mathematical geography and cartography by assigning to each place latitude and longitude. Ptolemy discusses his work but not the man. Codex Lat V F 32. Claudii Ptolemaei, Cosmographia tabulae, with an introduction by Lelio Pagani, (1990), Magna Books Leicester. 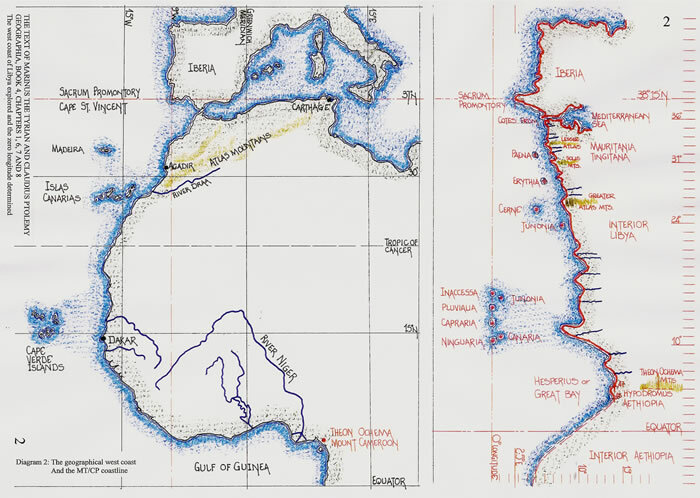 These are the maps contained in the text available from the National Library Naples, which has been used as a comparative text to counter the Stevenson translation. Berggren J L, and Jones A, 2000, ‘Ptolemy’s Geography: an annotated translation of the theoretical chapters’. Princeton University. 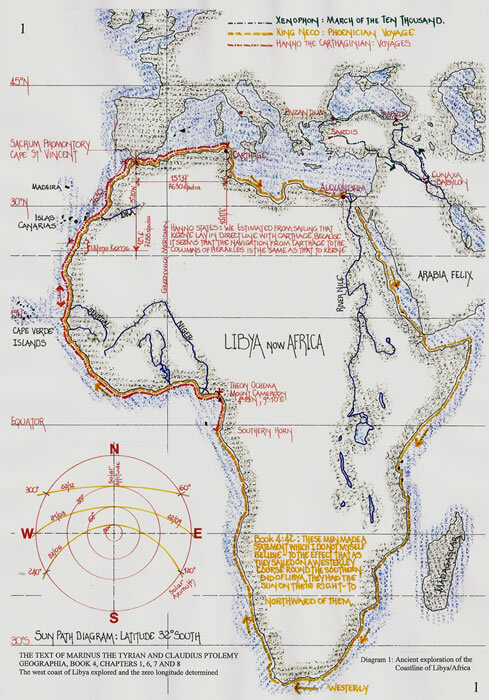 Rawlins D R, (2008), ‘The Ptolemy Geography’s Secrets’, DIO. The International Journal of Scientific History, volume 14, March, 2008. This text has in part F, ‘The Blest Isles Ignored and Identified: the Cape Verde Islands’. Chapter 3: Mapping Country and County, discusses the sixteenth century surveying and mapping knowledge. Saxton’s maps are dealt with in detail, page 66. Ferrar M J, (2008), ‘The Saxton Map, 1579: An Investigation’. On this web site. 10) Ferrar, M J, (2009), ‘Eratosthenes, Hipparchus and Strabo: Geographia’. Ferrar, MJ, (2009), ‘Strabo: Declarations of Eratosthenes’. Factual or Mis-quoted: An investigation. The river Nile measurements and the breadth of the oikoumene’. Ferrar, MJ, (2009), ‘Claudius Ptolemy: Falsification, Regimentation or Symmetry. The map of Britannia examined and the turning of Scotland resolved’. Ferrar, MJ, (2009),’The text of Marinus the Tyrian and Claudius Ptolemy, ‘Geographia’, Book 4, Chapters 1, 6, 7 and 8. The west coast of Libya explored and the zero longitude determined. H) Hawkes, C F C.(1977), ‘Pytheas; Europe and the Greek Explorer’. Eighth, J. L. Myers Memorial lecture: Oxford; Blackwell, 1977. 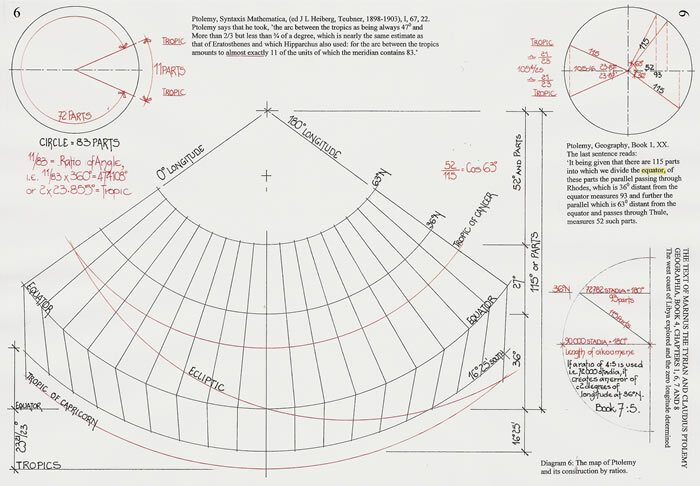 I) Dutka J, (1993), “Eratosthenes measurement of the Earth reconsidered”, in Arch. Hist. Exact Sci. 46 (1); 55-66.